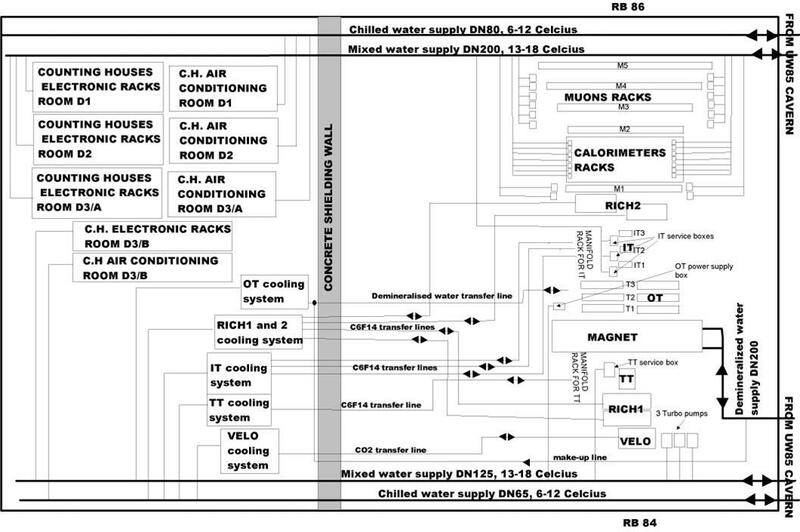 The engineering specifications of the cooling systems of the LHCb Detector are given in detail in EDMS 480222.v3. 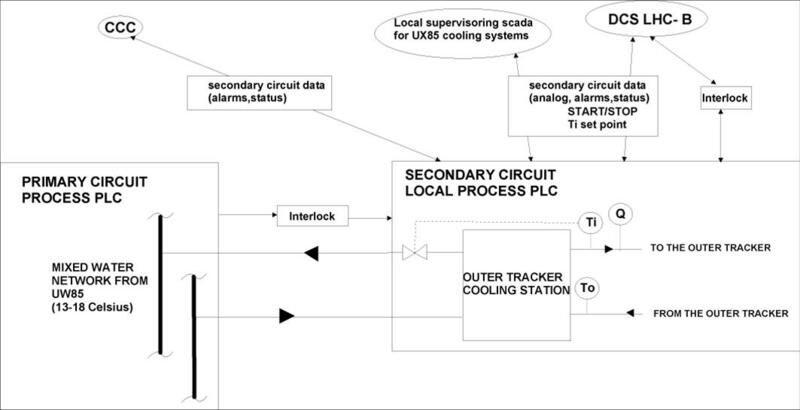 An overview of the LHCb cooling system is shown below; links to the relevant technical documentation can be found below. The design of the cooling system of the Outer Tracker has been done in collaboration with Paolo Guglielmini, Daniel Gasser and Michele Battistin, of the Cooling and Ventilation group of the CERN Technical Supporting Division (TS/CV). 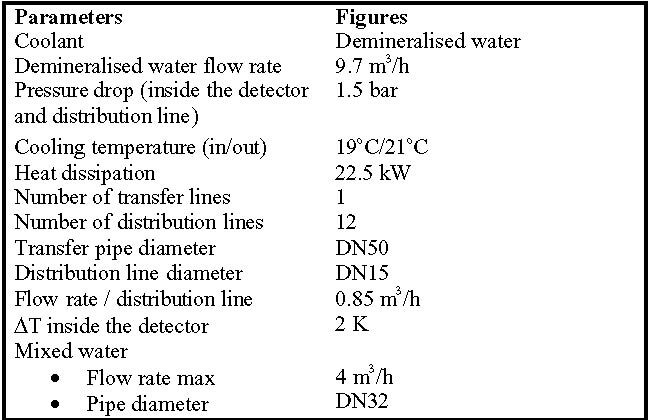 A global description of the OT water cooling system, as defined in the Invitation to Tender IT-3307/TS/LHCb (EDMS 549196.v1), can be found in the presentation by P. Guglielmini (NIKHEF, 19/05/2005). Links to the relevant technical documentation can be found below. The OT consists of 3 stations perpendicular to the beam axis. The electronic boxes dissipating heat are arranged on the upper and lower sides of each station. The total heat dissipated by these modules is about 15 kW. Taking a safety factor of 1.5, the cooling system is designed with a dimensioning figure of 22.5 kW. The primary sources of cooling water in LHC are the Chilled and Mixed Water, that shall be used in the LHC surface buildings in air handling units and in underground areas of UW and US in the heat exchangers. Chilled Water shall be produced at the temperature of 5 degrees and Mixed Water shall be produced at the temperature of 13 degrees. Links to the technical documentation concerning primary water cooling systems can be found below. The OT is cooled down with demineralised water; the coolant is supplied at 19 degrees Celsius by an independent loop connected to the mixed water through a heat exchanger. 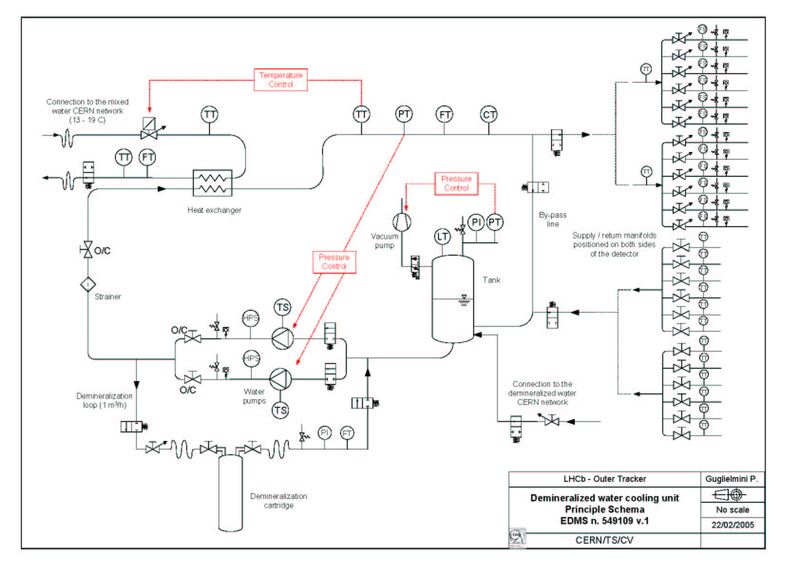 The make-up of the coolant loop is made from the demineralised water network. All the elements of the cooling system (heat exchanger, pumps, three-way valves, filters, etc.) are gathered on a common rack that will be installed on a metallic platform in the accessible area close to the shielding wall. The demineralised water quality is ensured via an ion-exchange cartridge (water quality, 0.1 to 1 uS/cm). There are two pumps in parallel, one being used for backup. The demineralised water, supplied by the OT cooling system, is sent to the detector through one (in+out) transfer line that splits into four manifolds (two on either side of the beam for inlet and return flow) at the periphery of the detector; each manifold has 6 distribution lines that feed the detector stations (2 ``curtains'' per station). The limit of the supply is located after each manifold. The connection between the manifolds and the OT is done by the LHCb collaboration. Each of the two inlet manifolds will be equipped with 6 balancing valves and 6 flow switches (on each distribution line). The total flow rate is equally shared among the 12 distribution lines. The actions will be available from the SCADA under DCS authorization only. The cooling station status and general fault will be available at the CCC. In case of a major failure in the secondary local process or in the primary process, an interlock signal will be sent to the DCS. The other way around, the DCS will send an interlock signal to the secondary local process in case of emergency. These interlock signals shall be hardwired. The PLC shall be based on Schneider premium TSX equipment. The OT cooling system shall be available 24 hours a day during the operation period of LHC. The shutdown period will be used for maintenance.